Miracle and is Eaten by Crocodiles. A miracle is an event that violates the laws of nature. One example is described in Matthew 14: 25-33 when Yeshua of Nazareth (a.k.a. Jesus Christ) and his disciple Peter are described as having walked on water. Jesus was on the shore of the Lake of Galilee. His disciples were in a boat at some considerable distance from the land. The author of Matthew described that Yeshua walked on the surface of the water towards the boat. Peter asked Yeshua to tell him to get out of the boat and walk on water. At first, Peter was able to walk successfully. However, he became fearful and started to sink. Jesus pulled him from the water, admonishing him saying "You of little faith. Why did you doubt?” They later climbed safely into the boat together. Does it take a miracle to walk on water? A man's sandals in contact with water are typically less that a square foot or 930 square centimeters in cross section. Depending on their construction, they might float on water by themselves. But if a man is wearing them, then his body will be pushing the sandals down into the water with his full weight. It would be impossible for him to either float on or to walk on top of the water -- unless, of course, a miracle happens. John Owen Nwachukwu wrote an article in the Daily Post/Nigeria newspaper about Pastor Johathan Mthethwa of the Saint of the Last Days Church. The pastor allegedly attempted to replicate the walking on water miracle in Matthew 14. Nwachukwu quoted from an article in the Herald Zimbabwe, which said that the pastor sank into a river, -- known locally in Zimbabwe as the "Crocodile River." He drowned and was viewed by some of his church members being eaten by three crocodiles. The members of his congregation explained that the pastor initially waded into the river. When he was about 30 meters (100 feet) from the shore, he attempted to climb on top of the water so that he could start walking on its surface. But three crocodiles appeared from nowhere and started feasting on him. Emergency responders arrived on the scene a half hour later, but the pastor was already long dead. Many newspapers in the UK, including The Independent, The Daily Mail, Unilad, Metro, the Express carried the story. They cited the Daily Post in Nigeria, which in turn cited the Zimbabwe Herald as the original source of the story. Did the event really happen? Apparently, the story is false. Snopes.com is a fact-checking web site. After an investigation, they concluded that the events in the story never happened. It is almost identical to an article that was circulated during 2016 in which only the names were different. Kim performed a Google search for "Jonathan Mthethwa" and found multiple hits. However, they all were directly related to this story. They found lots of hits, all of which describe the same crocodile eating event. "Thou shall not tempt the Lord thy God. Whatever you hope to achieve with your action is not faith, that's a serious suicide mission you embarked on. No one lives to tell the story. Shadrach, Meshak and Abednigo didn't [voluntarily] jump into the fiery furnace nor did Daniel jump into the lions den, they only had strong faith in God in the face of trial." "Dialing-up a miracle is the height of vanity; and vanity is never, ever, holy." "A pastor lost his life and 3 crocodiles gained a well needed meal... Mother nature takes no prisoners.. and cares nothing for human religions and human stories -- we all would do well to remember that." "he was a jackass.....didnt use common sense!!! !, u cant walk on damn water unless there is a bridge or better yet stay on dry land or a boat!!" "Ahhhh...another entrant for the 2017 Darwin Awards." 1. There is a lot of fake news out there containing descriptions of events that never happened. If it is as riveting as this one, suspect that it never happened. Do a Google search or two as Snopes and Skeptical Science did. 2. 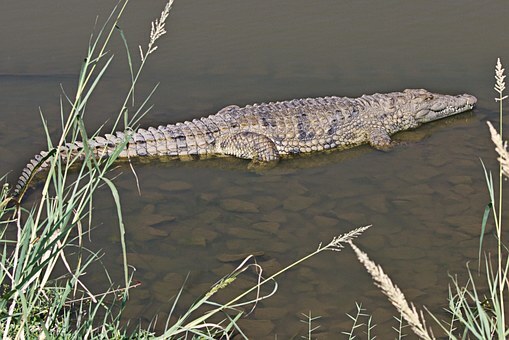 If you want to evaluate your ability to walk on water, select a river that is not infested by human-eating animals like crocodiles or alligators. 3. If you want to test your faith by seeking for a miracle -- a result that defies science -- expect to fail. However, make certain that people with cell phones are present so that your attempt is recorded for posterity.